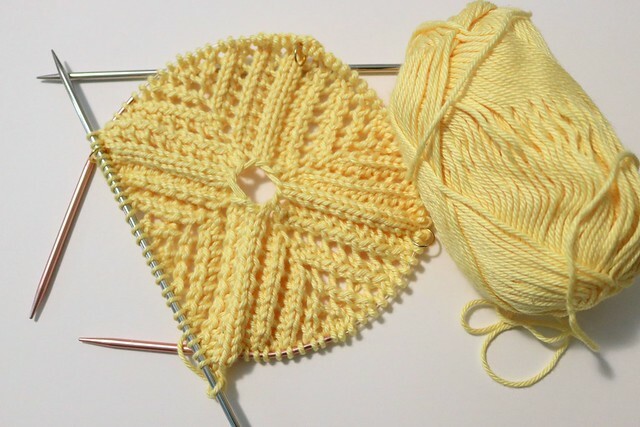 Glancing over at my knitting basket, I can’t help noticing it’s taken on a distinctly summery feel. I wouldn’t ordinarily have said I knit seasonally, as I am still making wool sweaters and heavy cabled things, but lately I have been craving softer, lighter colors, cotton and linen, and finer gauge yarns. I can also count on the summer for a major boost of start-itis, with three new cast-ons included (so far). The first is a shrug that begins with a square lace panel constructed from the center out (I will sew that hole shut in finishing). It’s intriguing to watch the lace pattern build organically, and I’m looking forward to figuring out how to convert the pattern to be as fully seamless as possible. 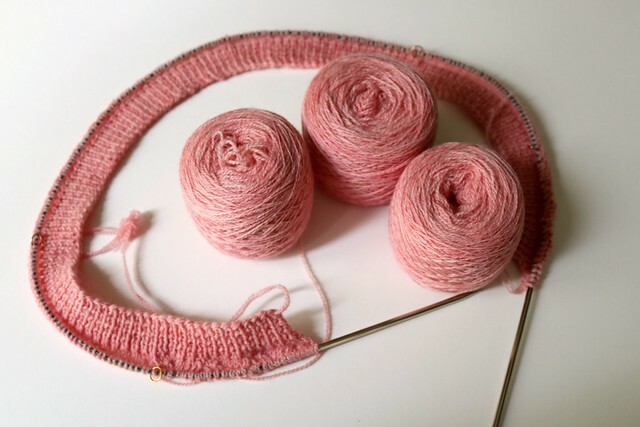 Next is Lepidoptera, which I will admit I cast on in a total impulse because I couldn’t resist the beautiful soft pink yarn wound up in a cake after I used a bit of it to finish the candy pink Featherweight sweater I’ve been working on for years. 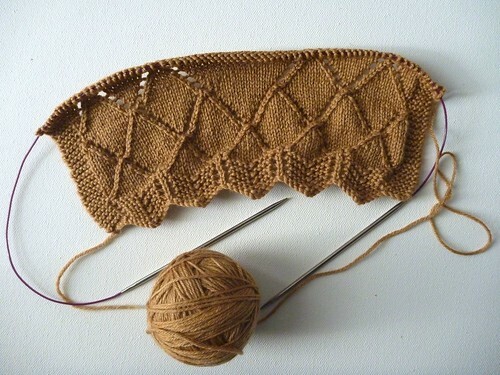 I love the look of this pattern, and I know I will eventually enjoy working on it, but because the two lace panels are knit with two strands of yarn held together and there is an expanse of one-strand stockinette in between, one winds up juggling three balls of yarn at a time. I haven’t mastered the maneuvering yet, so this project is neither particularly easy or portable. I can’t help wondering why it wasn’t designed with two strands held together throughout, but I’m sure time will tell. 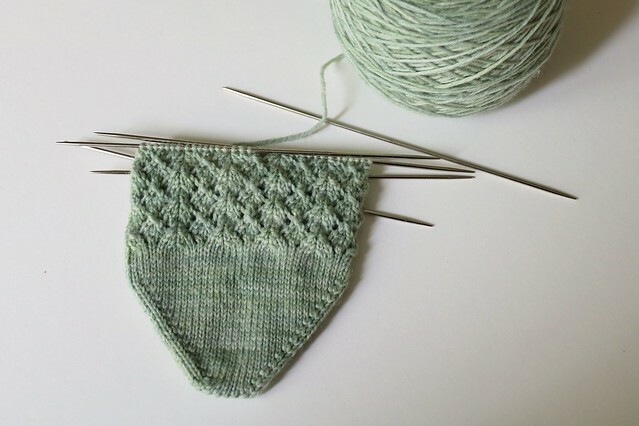 Lastly, a pair of Catnip Socks, a beautiful free pattern by Wendy Johnson that I have had queued since 2010, knit in this soft green hand-painted yarn that I love fanatically. I was chiding myself for casting on new socks when I have been trying to focus on sweater-knitting and have a huge pile of finished socks that I haven’t blocked or photographed yet, but I was able to justify them by the fact that I work from home and my apartment gets frightfully cold in the winter (and autumn…and often spring). Like most New Yorkers, I am nuts about not wearing shoes indoors, so I wear socks and slippers almost every day – they might as well be hand-knit, right? These socks also gave me the opportunity to participate in my favorite sock-knitting group on Ravelry again, and I hadn’t realized just how much I missed the community and camaraderie there until I logged back in and poked around. 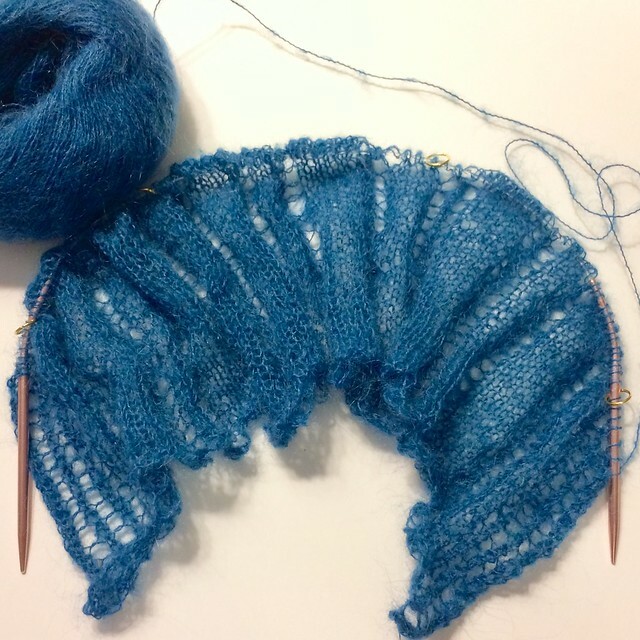 When I saw the July-August challenge is lace, I entered some kind of fugue state where my hands were winding the yarn and pulling out needles automatically. And on the theme of community, I have finally set up an Instagram account just for my knitting and crafts: @vickiliciousknits. I hope you’ll hop over and say hello – I’d love to connect with fellow knitters and craft-obsessives! I have a lot of catching up to do. Let’s start with three new cast-ons from the end of the summer / early fall. 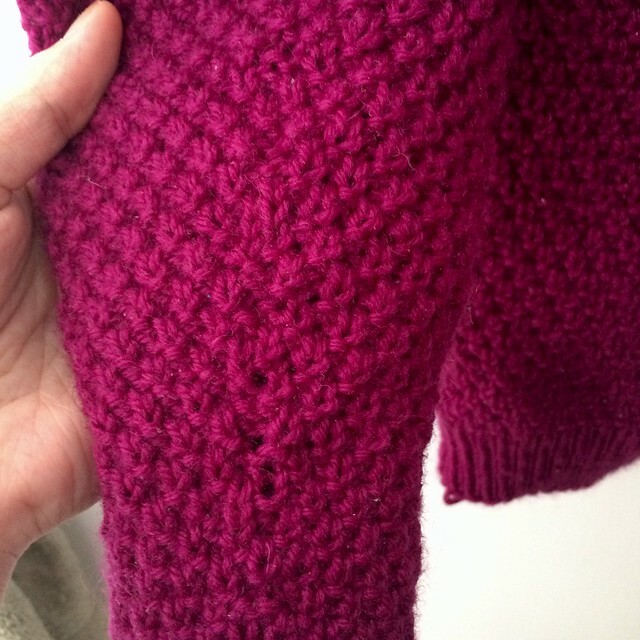 The first is a lacy cotton-modal blend cardigan, which I am trying to work completely seamlessly using this lovely Knit Picks Shine in Crocus, a fuchsia color that still reminds me a bit of phenolphthalein. This yarn had been committed to a classic Erika Knight Deep V-neck sweater for oh, nine years (have I really been knitting so long??) 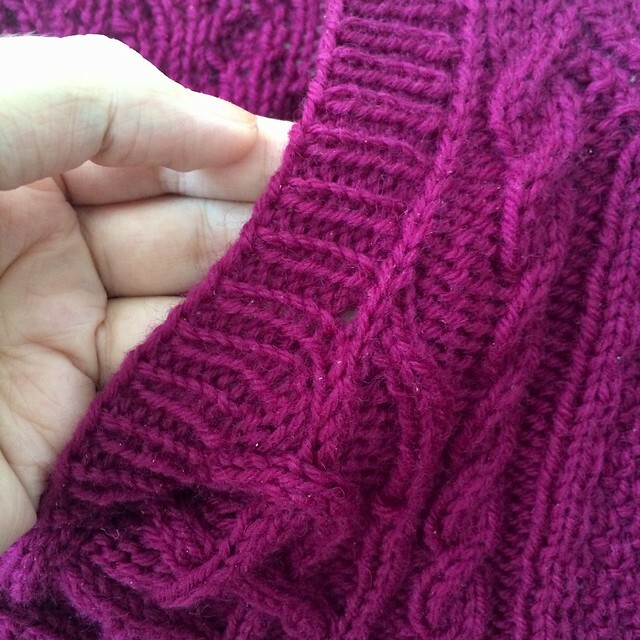 but I ultimately decided I just didn’t want to deal with the seaming. 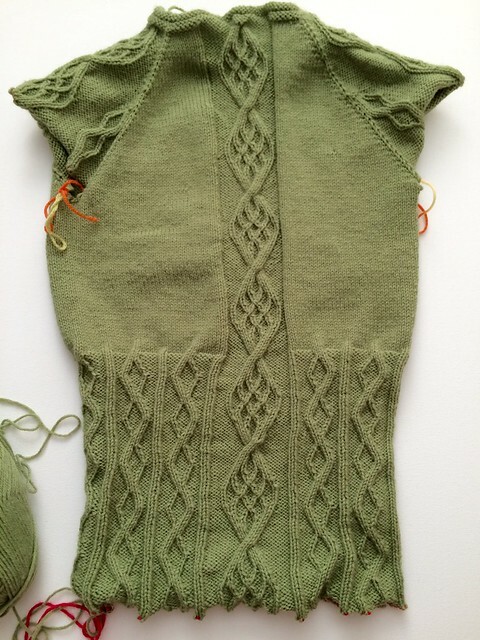 I also felt like the fabric of the sweater was too drapey and would make for a clingier fit than I wanted for a long sleeve pullover. 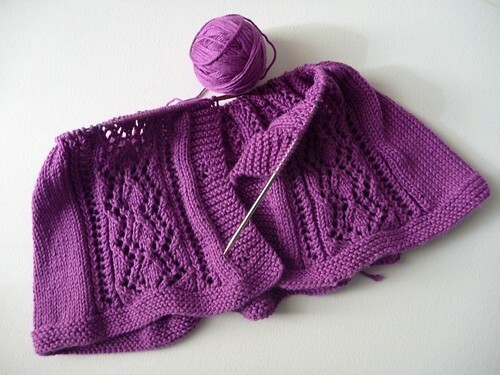 I’m delighted with the lace pattern and fabric being created, and I think it uses the airiness and drape of the yarn better for something I can wear over dresses and blouses in the spring, fall, and cooler days of summer. 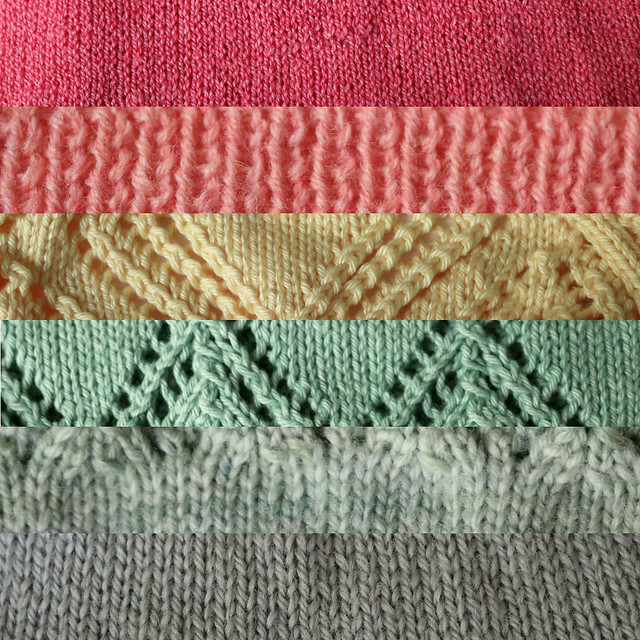 Recently Interweave ran a great sale in their online shop, and I scooped up several digital editions of Knitscene that I’d been meaning to get for $3 each. I immediately cast on for the Byzantium Stole in a beautiful tan wool-silk blend that I can already see myself wearing with a green motorcycle jacket that I don’t wear often enough. 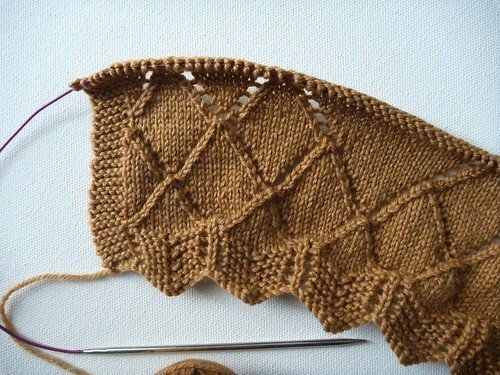 I love the clever geometry of this pattern and how it’s coming together in this yarn already. 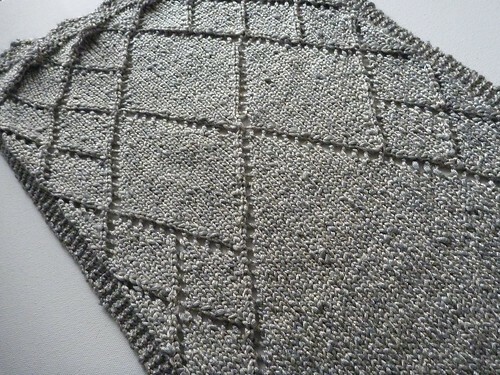 As I was knitting, admiring the Art Deco sort of pattern that was emerging, I kept thinking about this metallic silvery yarn that I had tried to turn into a shrug (with pretty disappointing results). 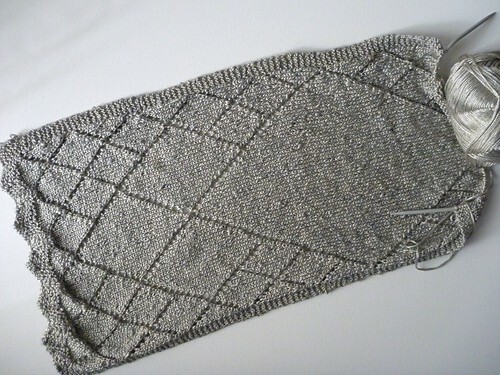 What if I worked this scarf (let’s be real) on larger needles to make a bigger, wrap-like stole? Of course as soon as I found the right sized needle, I cast on for that too, and I’m happy with the way it’s coming together. I don’t usually work the same pattern in two yarns / gauges at the same time, but they have such different feels that I think they will result in two unique pieces. 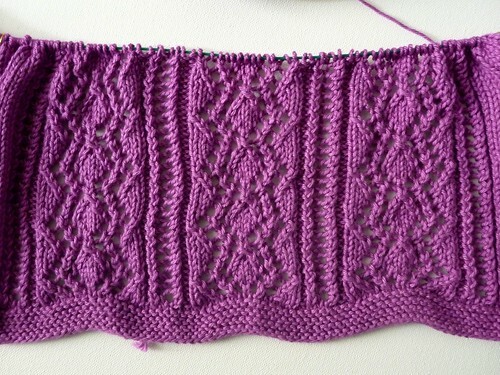 Plus I enjoy the clever pattern so much I look forward to knitting it twice. This yarn is still having some issues, which unfortunately seem to be part of how it’s made (I’ll discuss this more soon). It also keeps snagging on the join of the circular needle I’m using, which is maddening, but I guess it will save me the anxiety of when it inevitably catches on my earrings, zippers, or whatever other things always seem to reach out to grab my scarves while I’m wearing the finished stole. So, much more soon! 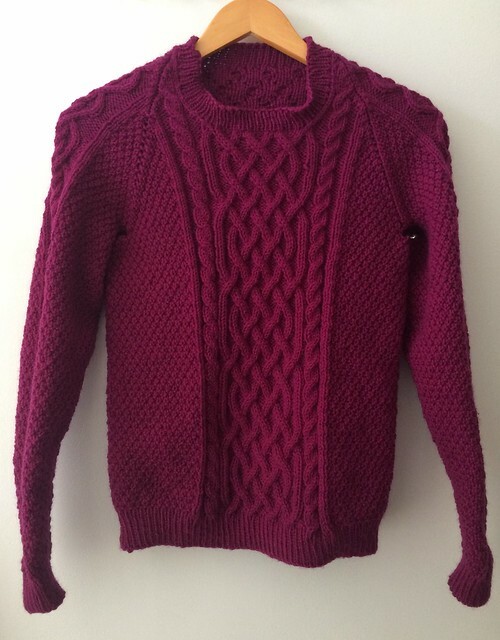 Maybe I’ll even photograph some of the sweaters I’ve finished lately. 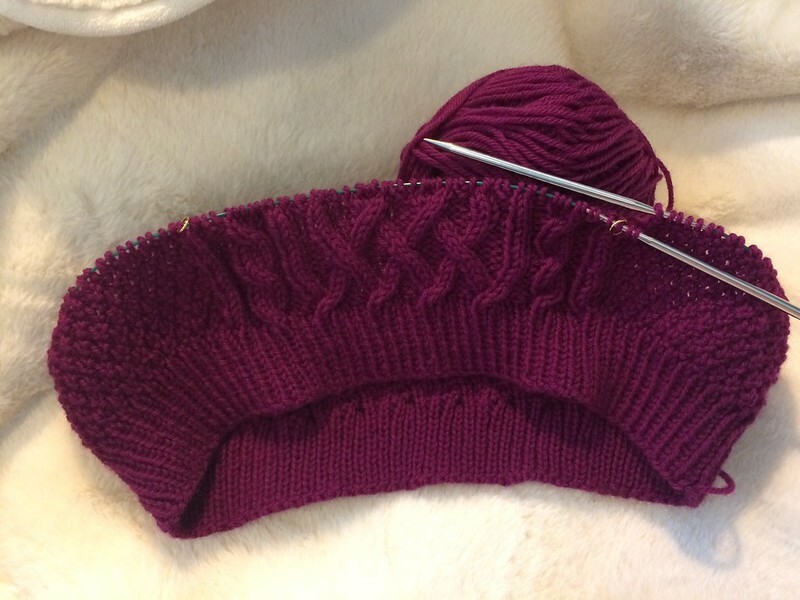 … before I realized I was making the wrong size. 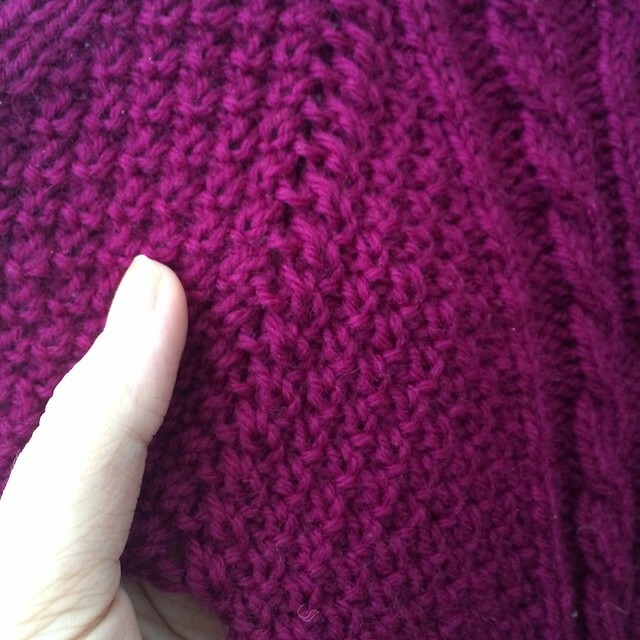 I had calculated the gauge years ago using a much thicker yarn. While this size technically fits, it doesn’t fit well, so I’ve started over. I’m certain I brought it on with the hubris in my last post. As a silver lining, I am glad that it gives me the chance to fix a few flubs I’d made in the very beginning. Fourth time’s the charm?